Snail mail is alive and well at Leta Austin Foster Boutique. 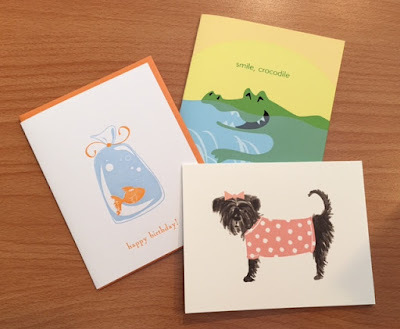 Thankfully, our customers embrace traditional etiquette when it comes to sending greetings for special occasions. 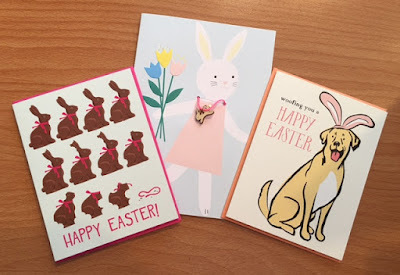 For this reason, (and because we love all these cards ourselves) we search for unique and adorable paper card companies that will deliver your intended message in an artistic and creative way. 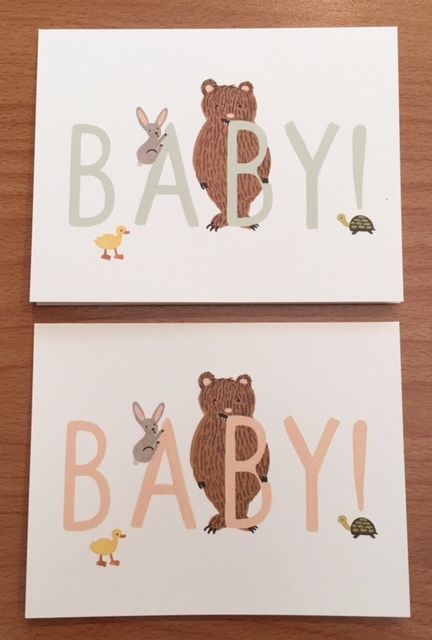 We order from a variety of companies with names like Meri Meri, Rifle, Great Arrow, Smudge Ink, Tokyo Milk, Paper Source, Lucca Paperworks and Maileg......no Hallmark here! 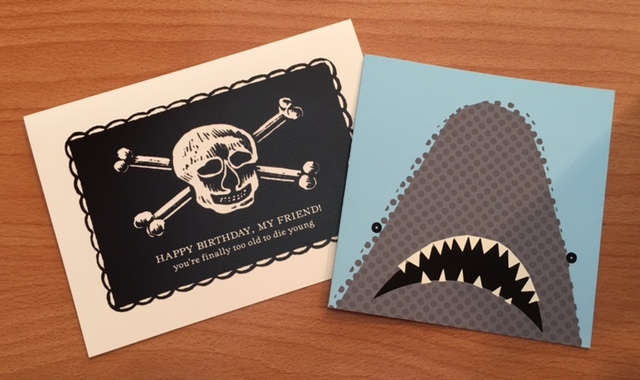 While most of our selections are sweet or nostalgic, we do have a wicked sense of humor especially about growing older as illustrated by the Skull and Crossbones card, which states, "HAPPY BIRTHDAY, MY FRIEND, you are finally too old to die young". The card with the graphic shark says, " Getting older really bites." There are lots of non-offensive birthday cards as well in all sorts of themes. These pictured are all animal-themed.....we DO love our animals! 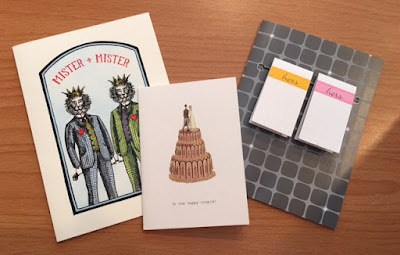 If you are looking for a Wedding card, we have some elegant and ornate ones, some cute ones like this wedding cake and some clever non-traditional ones. 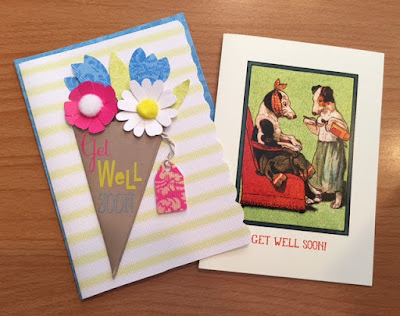 A Get Well card is always appreciated. 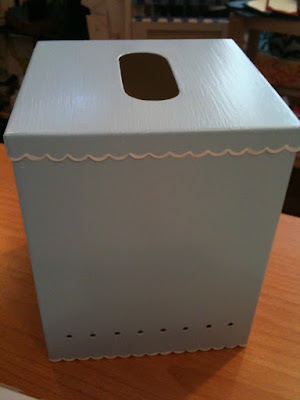 Such a small gesture will do wonders for your intended recipient's spirits. Our Sympathy card selections are not full of tear-jerking verses, but rather simple messages delivered on sweetly designed creations. 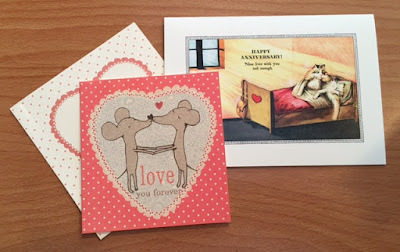 Anniversary cards should be purchased well before the date, otherwise, there is a good chance that you may forget. The card with the mice, created by a very creative Danish company, is our new favorite. 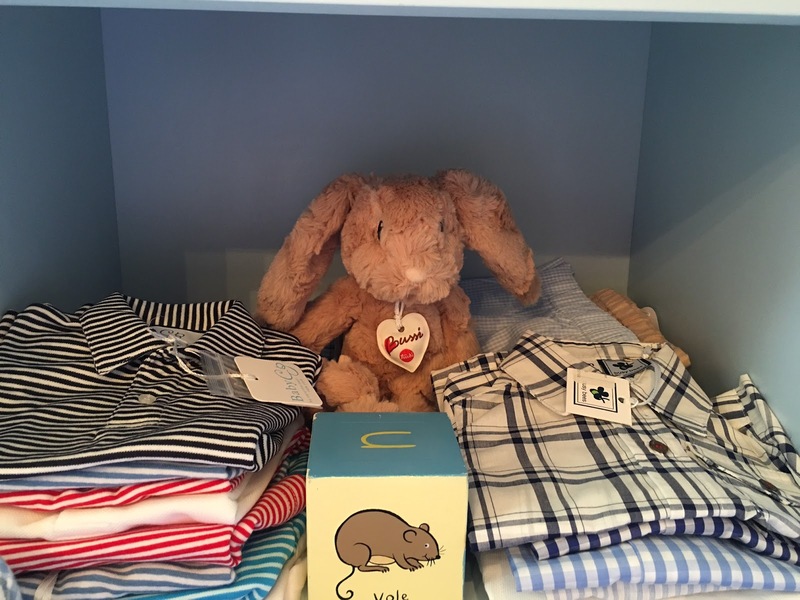 You may not want mice in your pantry, but on a love note, mais oui. A life saver for those of you that dread writing a long, hand-scribed thank you note, is a Thank You greeting card. 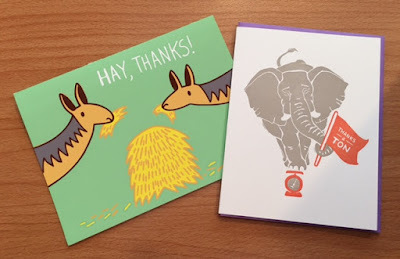 A cute picture and to-the-point message leaves a minimum of space for a personal note. 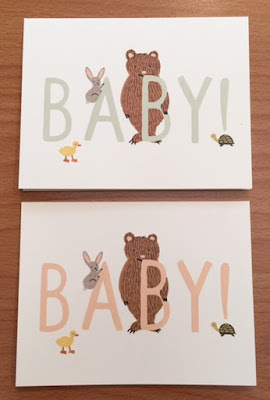 We sell tons of Welcome Baby cards ! 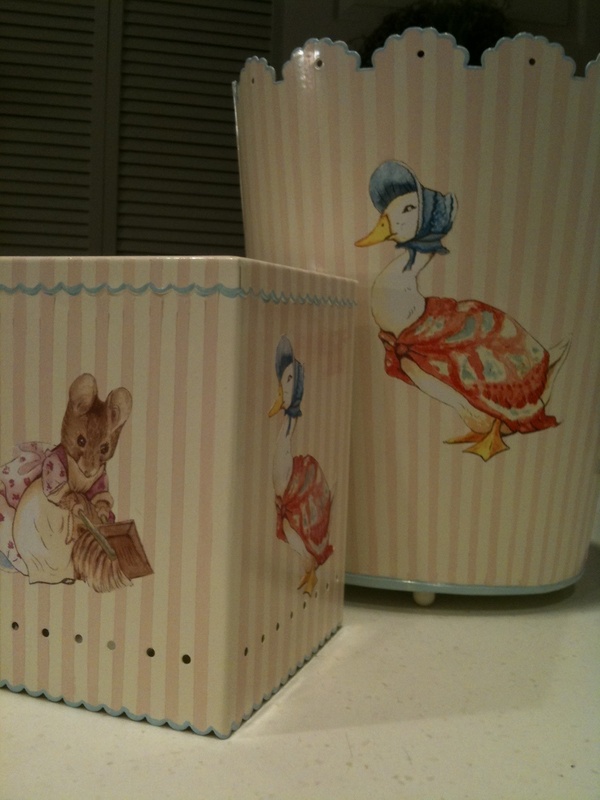 These two from Rifle have become our most popular ones. If it is a very special Baby Announcement card or an Invitation to a Birthday Party card that you are looking for, look no further than these custom-made, hand-stitched felted wool designs accented with your own words and mounted on acid-free Italian paper. These are so loved that customers have framed and hung them or glued them into a scrapbook for a remembrance. Just a note to any of you that do scrapbooking.....Bravo to you for finding the time, the patience and the creativity! While all my photos are crammed into boxes (not archival, I'm afraid), I do plan on getting them into some order and into a photo album someday. Of course, I have been saying that for 30 years, so it may never happen. 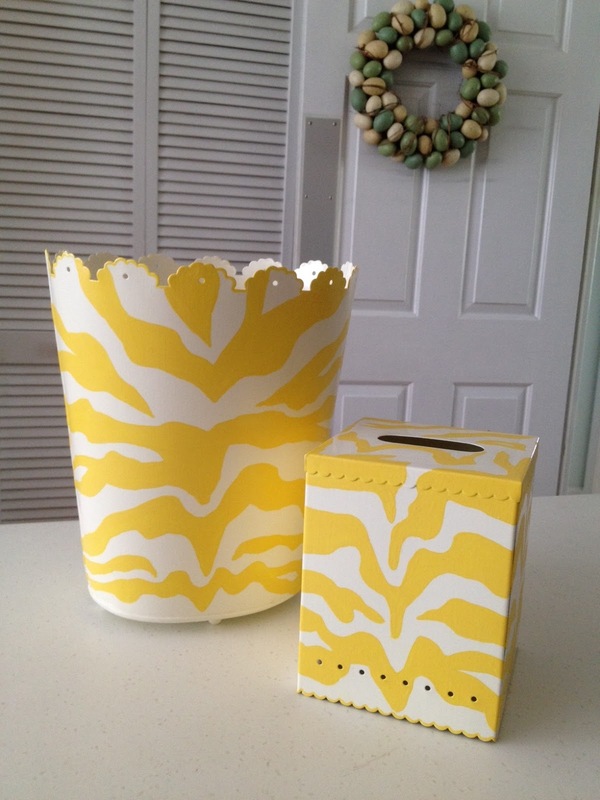 However, what I have done is organize my Greeting Cards by occasion so that I will never be caught short. 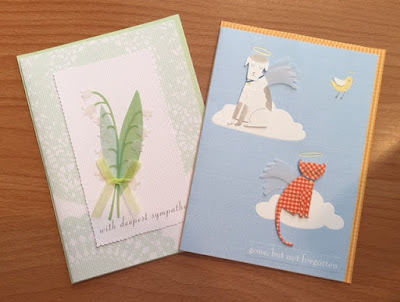 I urge you to collect cards as you find ones that you love or are perfect for certain friends or family and file them away for that special day. We do have many cards in the Boutique that can start you on your way to a fabulous collection. Yes, you heard it right and you heard it here first ! Leta has taken another plunge into the pool of modern technology. 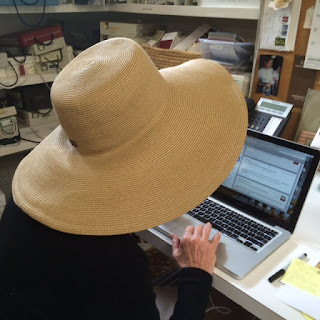 She will be checking out all your Instagram photos and hopes to have you check out her postings as well. 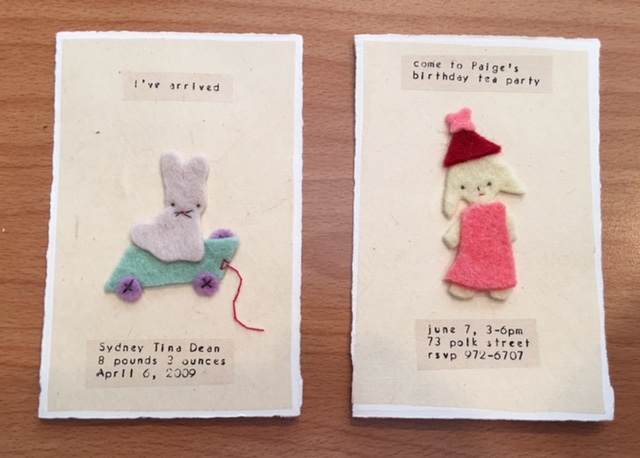 We are all looking forward to glimpses into Leta's design world as well as photos and happenings around the shop and on her book tours. BUNNIES AND LAMBS AND CHICKS......OH MY ! Another Easter fast approaches (it's actually in March this year), but never fear, we are all set to help you fill those Easter baskets. By now you know that we LOVE Surprise Balls for every occasion. 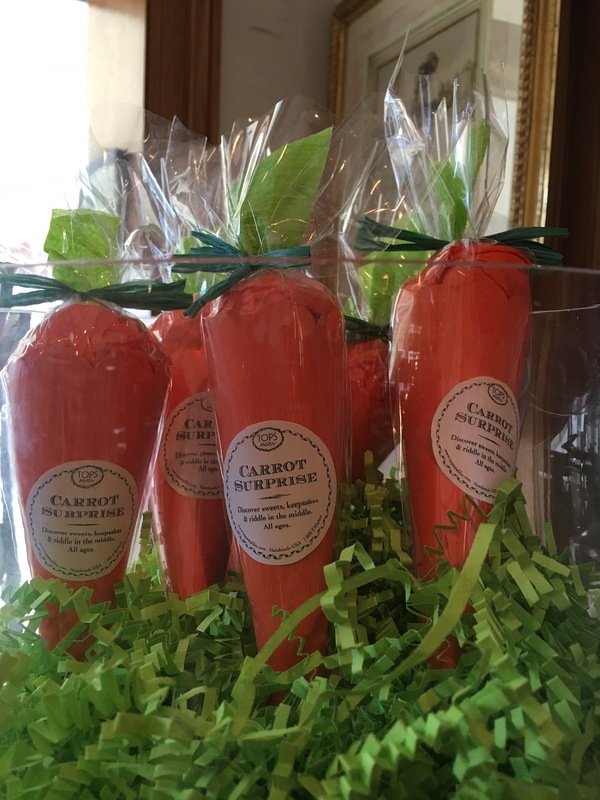 Easter is certainly no exception! 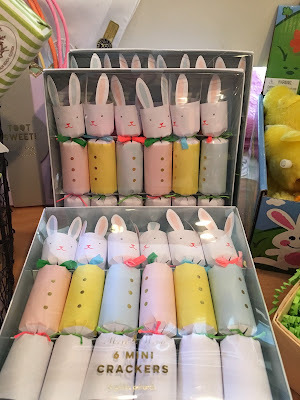 Our large deluxe crepe-paper wound balls are decked in pastels and are adorned with a gold German bunny silhouette. Surprise cones (which hold a smaller surprise ball) are a favorite when they are disguised as a carrot. 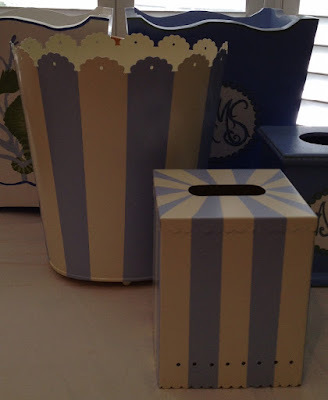 ....and as adorable scallop-collared decorated favors. Surprise balls in every shape and size are already hopping out of the shop, so you had better call early before they disappear. 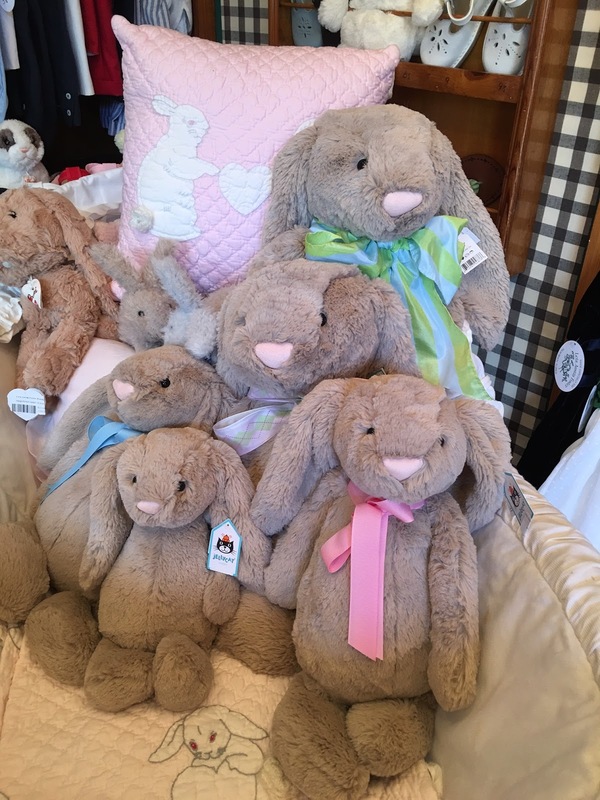 We have the cutest little bunnies ever that look almost real.....ok, they look completely real ! 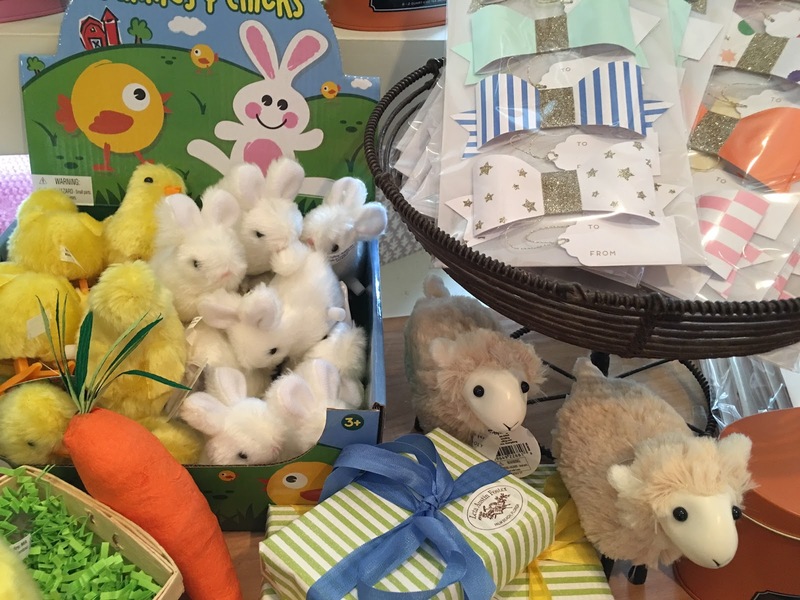 No matter how many bunnies we order for Easter, it is never enough. We had hoped they would multiply, but it is just not happening. 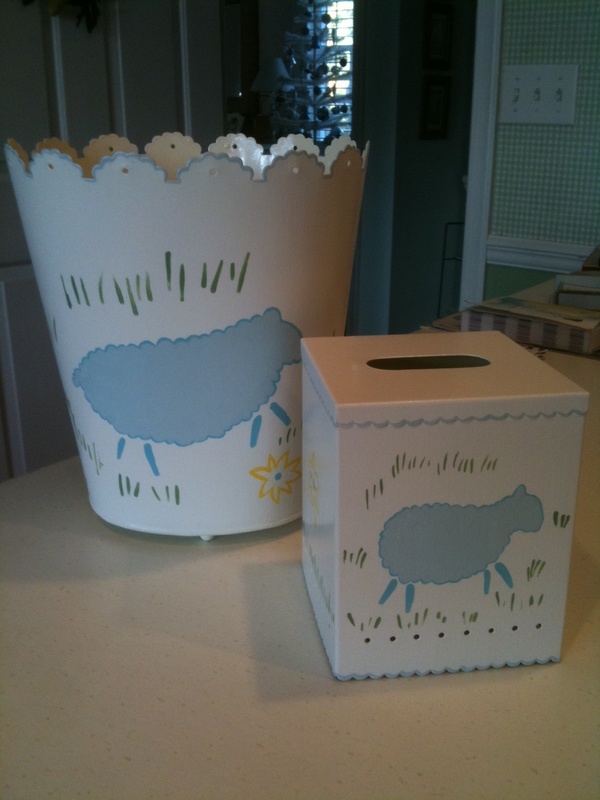 Trudi, one of Italy's finest stuffed toy makers, sent us these adorable lambs. They come in two sizes of fluffiness and if you look closely, you will see they have a belly button.....awwwww. Easter mini crackers would look perfect at each guest's place at the table. Inside the poppers is a joke, a hat and a bracelet. 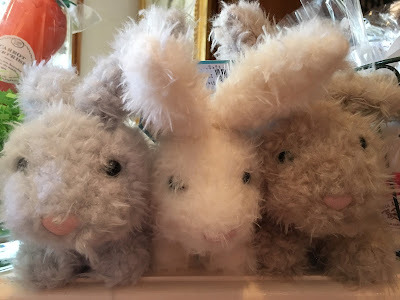 One of our favorite new toy companies from England, Jellycat (the owner let his daughter name the company) makes these very soft and cuddly bunnies in three sizes. 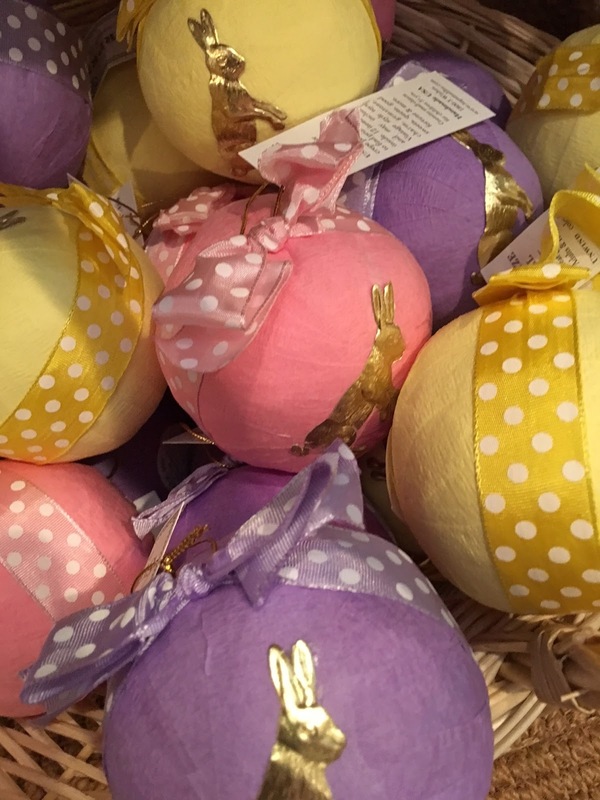 Although most of these sweet buns are purchased for children, many adults buy them for themselves. Who could resist those faces ? 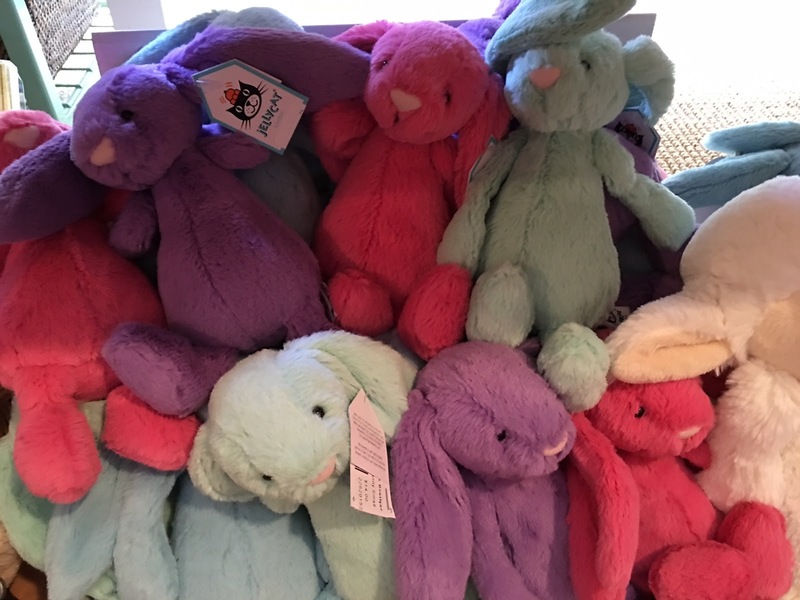 We also have a large display of jelly bean-colored Jellycat mini bunnies. 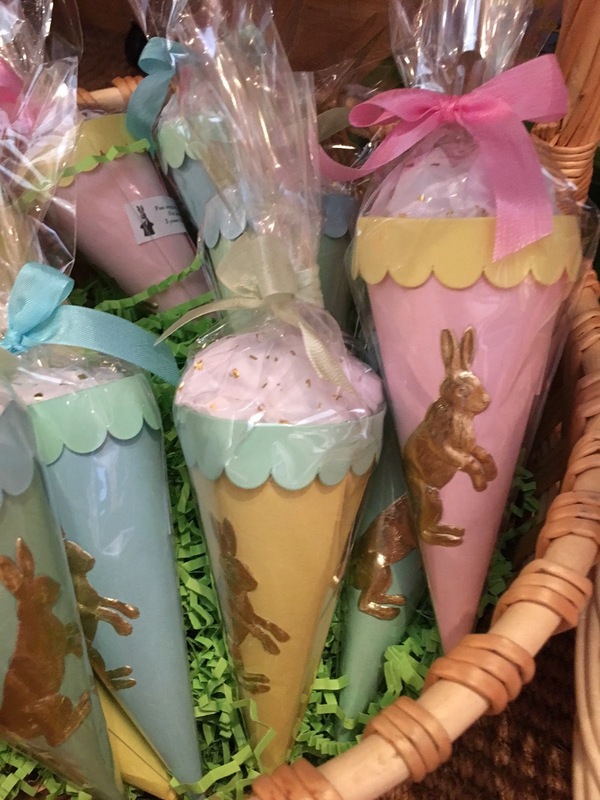 They are the perfect size to pop in an Easter basket. Before you leave the shop, see how many bunnies, chicks and lambs you can find tucked in a shelf or peeking out a window. We have them everywhere, but not for long..... hoppily (sic, I couldn't resist), they are being adopted daily. 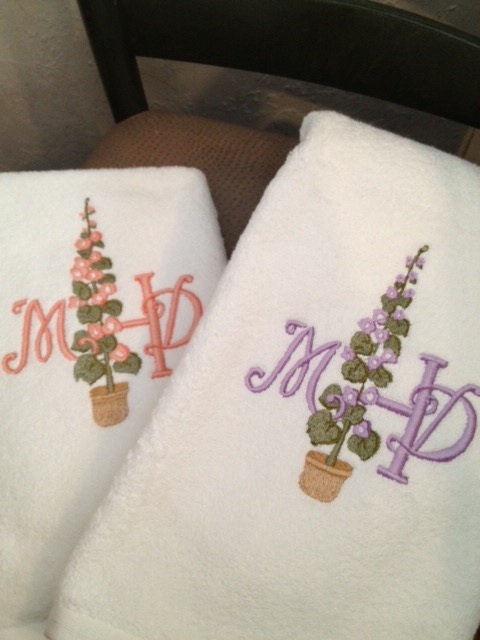 We personalize a lot of towels, bed linens and clothing items for our Boutique clients. With every order come a lot of questions because there are so many variables. 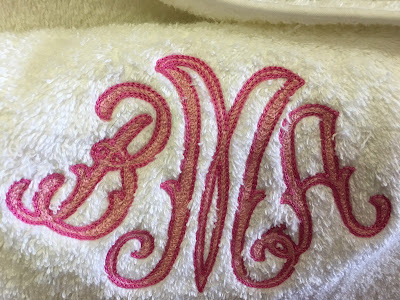 Most of our monogramming is done stateside by a terrifically talented woman, Fatima Vaz. Her atelier is a true artist's studio and she (and her team of well-trained seamstresses) produce some of the finest monograms and embroideries I've ever seen. These embroideries are hand-guided works and are of the highest quality stitchery created using a machine. Her sewing machines are not your modern-day computerized jobs that robotically stitch a preprogrammed design. Rather, they are old-fashioned behemoths that require the skill and dexterity of an artist to create a masterpiece. 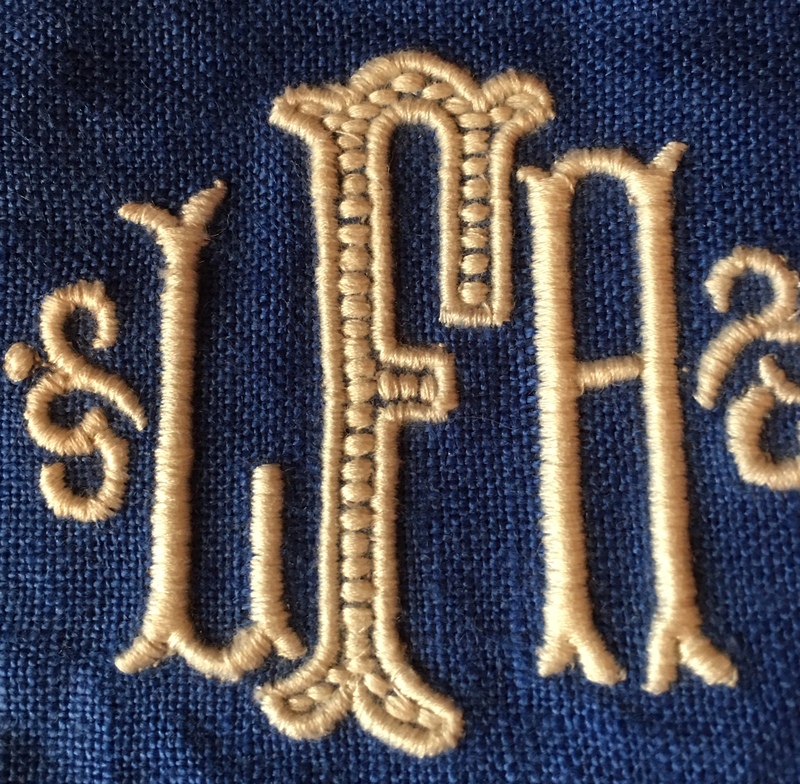 Each time we send an order for monogramming, we must choose a stitch. The type of stitch and its size determine the cost of the monogram. 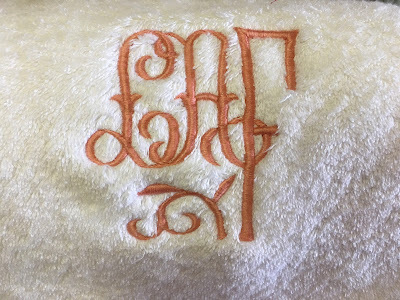 For example, a towel can be embroidered in French Knot, Ringstitch, Swiss Flat or Swiss Filled stitching. In addition, each treatment can be shaded, outlined or two-tone. 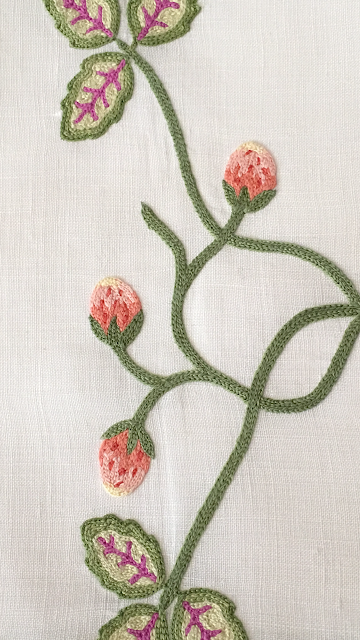 The French Knot, as the name implies, is a tightly-packed clutch of little knots. 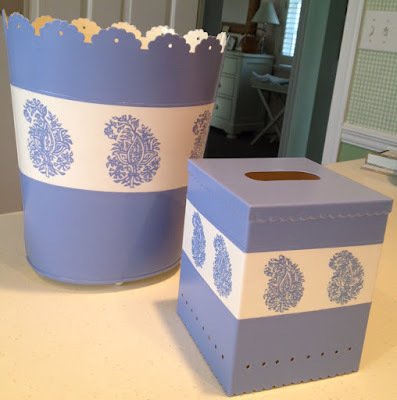 It is the least expensive stitch and lends itself well to the texture of terrycloth. Ringstitching is a series of chain-like links that take on the shape of an arc as they fill in an area. 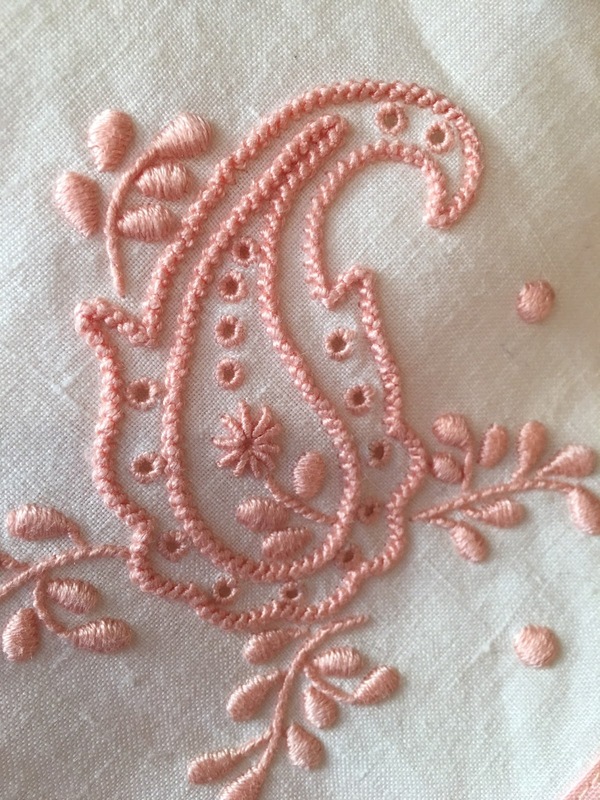 Swiss Flat style of embroidery is also referred to as Satin Stitch. 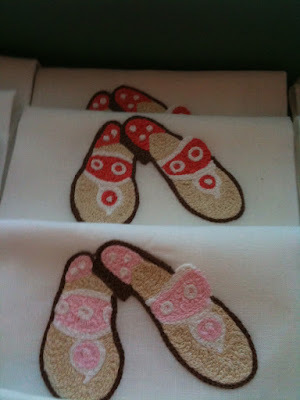 It is a smooth and straight stitch that imparts a more elegant feel. Swiss Filled stitching is a Swiss Flat stitch that has been embroidered over repeatedly, or in some cases, actually has a cording under the stitching which gives a three-dimensional effect to the work. 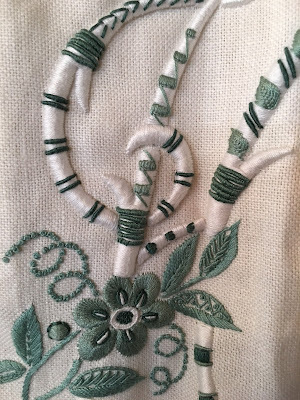 This is the most expensive type of machine embroidery. 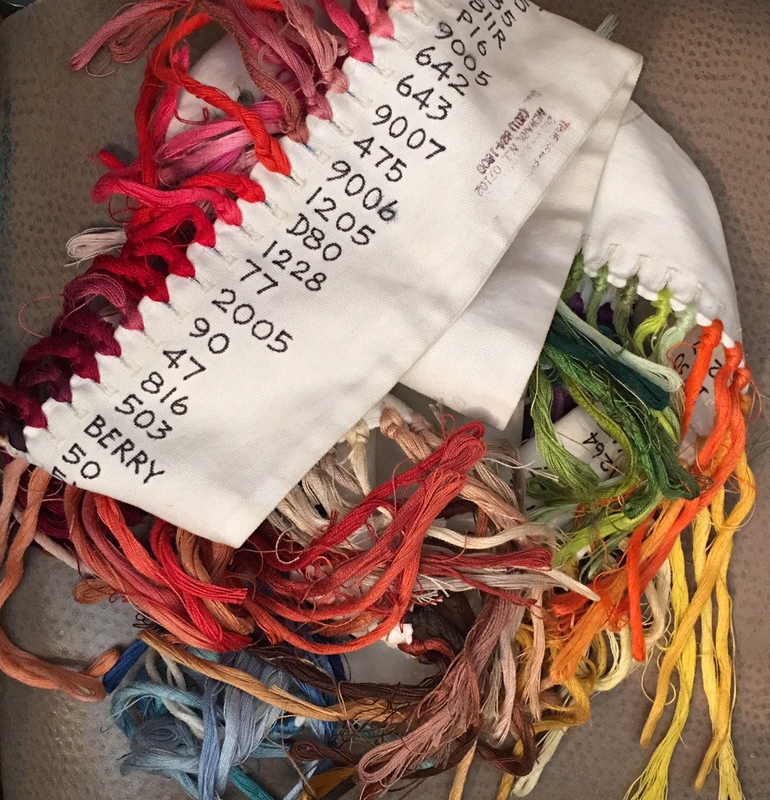 After the stitch is determined, our customer may choose their colors. 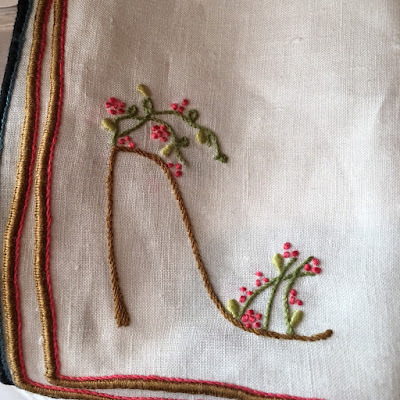 We have two thread charts for domestic embroidery. 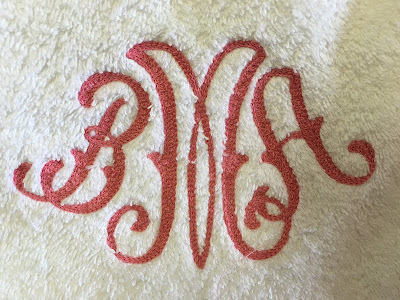 One is DMC which many of you who are needlecrafters will recognize, and the other is a custom thread selection created by our Monogram House. All of our custom-ordered, embroidered designs on bedlinens and towels are made in Italy, France and Portugal. 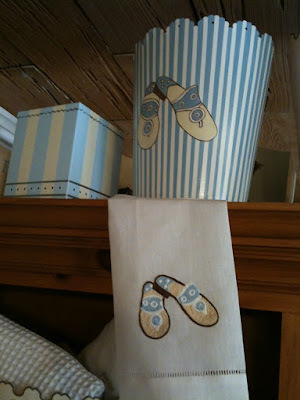 Those of you that are frequent visitors to our shop know that you can design your own linens and towels and re-color them any way you choose. Lin de Chateau Placemat & Napkin, set $396. 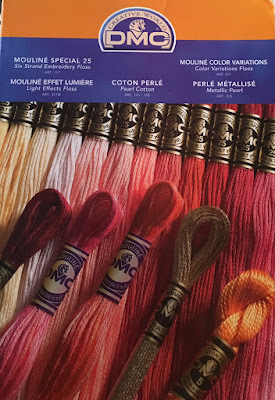 For embroidery being done overseas, we have different charts for color. Our Italian workrooms use threads from Filgi and Aurifil whose color choices are extensive. For all you embroidery aficionados, we also offer beautiful (and yes, very costly...but worth it) hand-embroidered linens. These are offered by Lin de Chateau of Paris and Sharyn Blond in Portugal (who ONLY do hand-embroidery) and Nouez-moi and Noel (both of Paris) who offer hand-embroidery as well as machine-stitched designs. Sharyn Blond Cocktails, set of 6 $312. 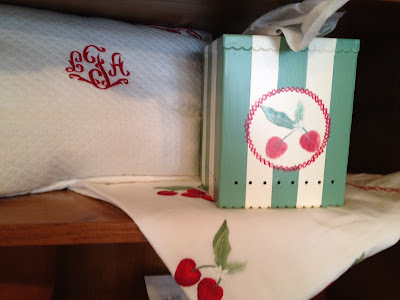 Lin de Chateau Napkin $240. 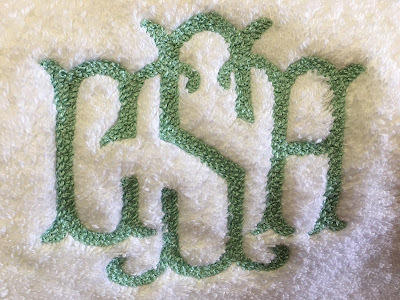 Nothing trumps the variety of hand-embroidered work and the talent and creativity of our thread "wizards" never ceases to amaze us. 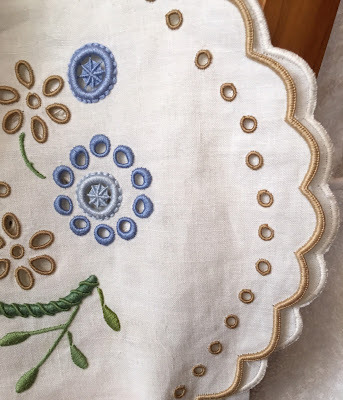 Our love of embroidered needlework has also led us to scour the marketplace for exceptional vintage linens from D. Porthault and Marghab. Check with us often if you share this addiction and are a collector. 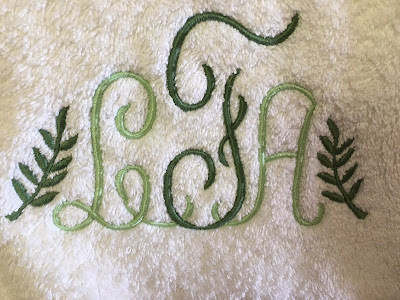 We may have just what you've been looking for, and if not, then together we can create your own one-of-a-kind embroidered work of art. We just got in a new style of Sonnet Shoes that will not be available in the U.S.A. next year. 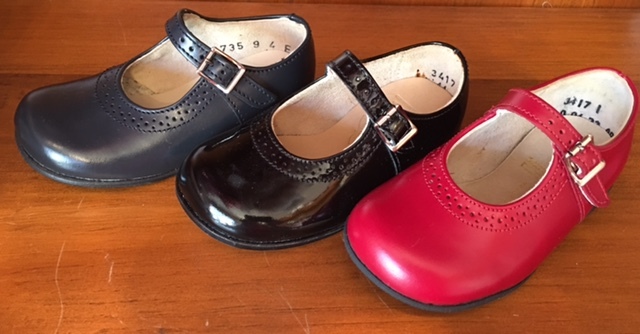 A lovely little shop in New York is closing its doors and asked us if we would like to buy their existing stock of "Clare" shoes. We jumped at the chance and got them for a steal.....so we are passing the savings on to you ! These adorable, classic Mary Jane-style leather shoes, which normally retail for $125. are now available for $70. a pair. We have three colors ... Red, Navy and Black Patent. Sizes we have in stock are 4-9 (whole and half sizes). Hurry, and nab yours today before they are all gone. 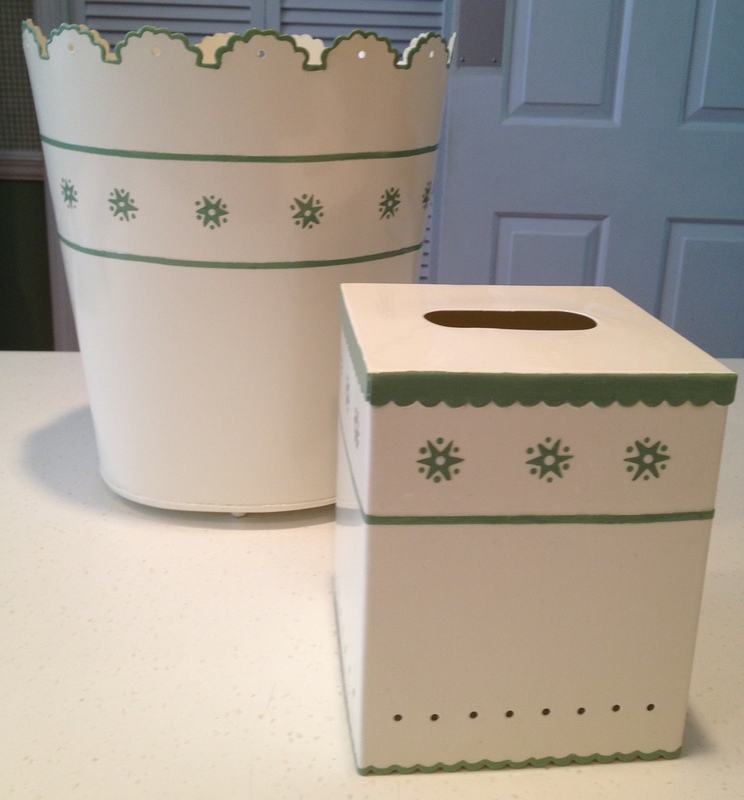 Many years ago I ordered a few French Tole wastepaper baskets and boutique tissue cubes for my store. 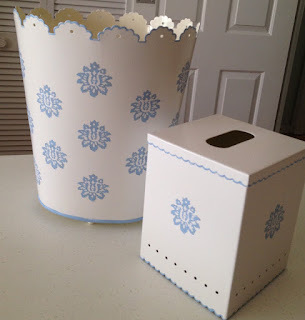 They were just plain white (kind of a Farrow & Ball "Pointing" white) powder-coated enameled tin with the most adorable scalloped edges. Needless to say, they flew out of the shop. 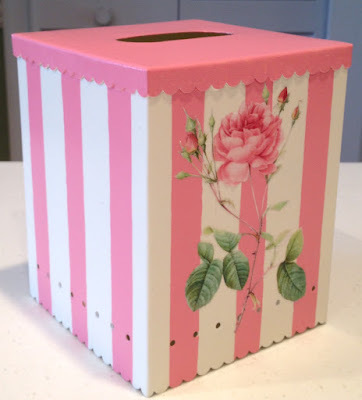 Betty and I decided that we should order more and even offer to custom-paint them for customers so they could have a blue one, a pink one and maybe a striped one. However, our supplier had moved on to another style which was not adorable at all ! Never ones to shy away from a challenge, we set out to find and order these baskets and boxes for the store. 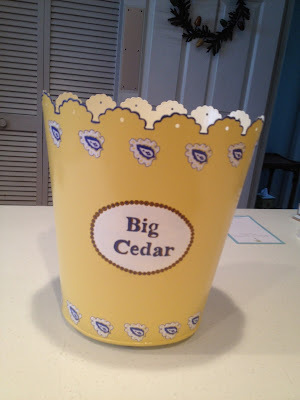 Well, we did find them but we had to have them made especially for us and we had to order about a billion of them......at least it seem liked that many. While you can still buy a "naked" wastebasket and tissue box, why would you want to when there are so many wonderful options to choose from that would make them your own? This client wanted a basket that coordinated with the bathroom wallpaper in her vacation cabin. She asked for the cartouche with the name of the cabin, gave us a sample of the wallpaper and helped to choose just the right yellow for the paint. 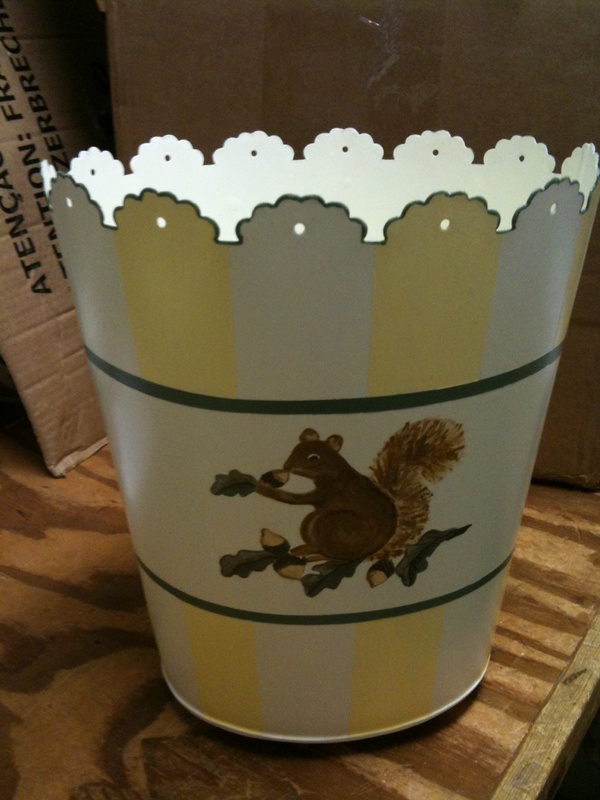 Sometimes, we paint baskets and boxes for the store stock. I thought it would be nice to have a Tiger pattern that was color coordinated to match the D. Porthault "Tigre-brown" linens that we carry. This basket lasted less than a week on the floor before being snapped up by a savvy shopper who also bought a set of the Tigre linens. 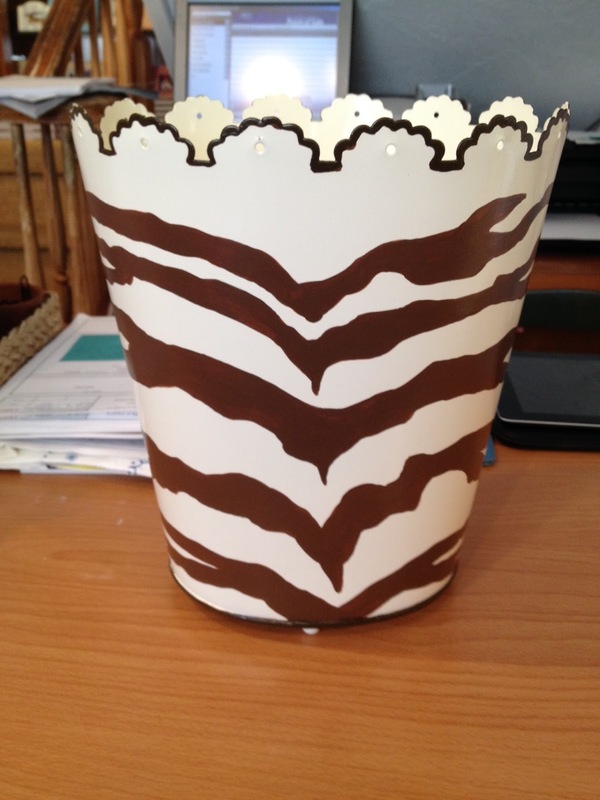 We have also painted the Tiger (or Zebra pattern.....as it does look like both) for many clients in their choice of color. 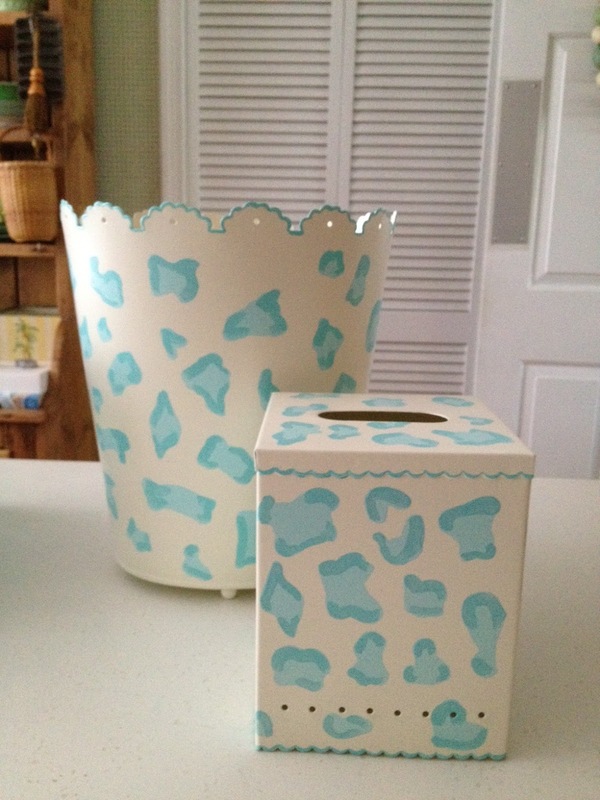 So too, for the leopard design above. 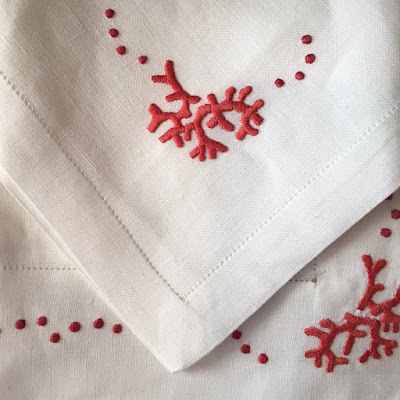 These Cherry hand-embroidered bedlinens from Nouez-moi in Paris, called out for a wastebasket and tissue cube to match and we obliged. Betty's drawing of the famous Palm Beach Sandals has been painted in many colors....hot pink, lime green, and light blue. We even had our fabulous monogram house copy the deign onto some linen guest towels. 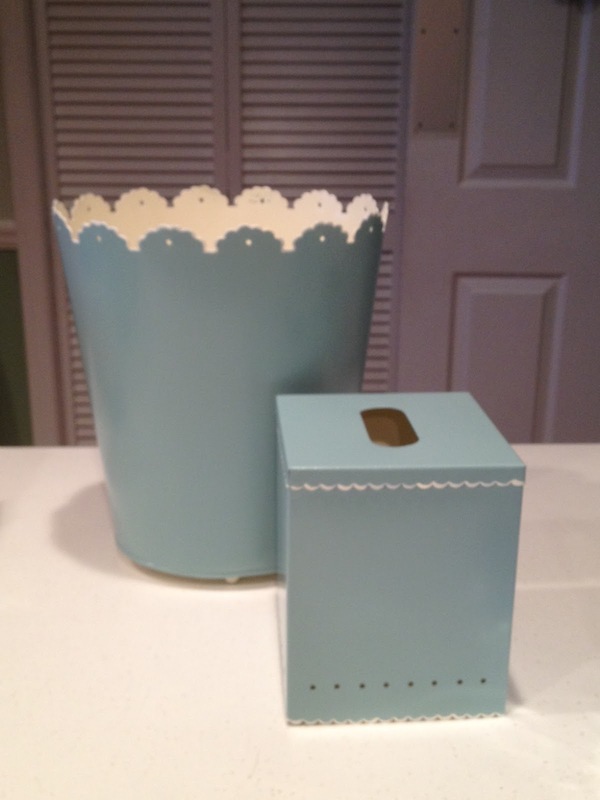 What a cute addition to a Powder Room these would make! 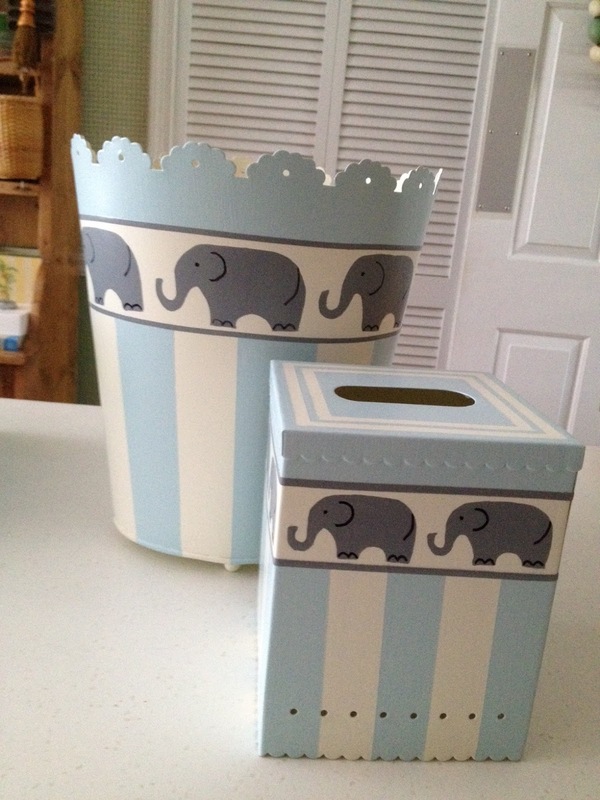 We were commissioned to create the whimsical elephant design for a very lucky baby's room. We have since reproduced it with pink stripes and with beige stripes (always leaving the little pachyderms their natural color). Eventually, we made a set for our baby department and it is in stock now......what a great baby present this would make! 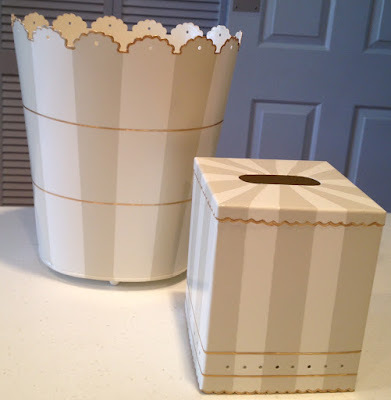 This basket and cube set were designed for a Guest Bath ..... again to coordinate with an existing wallpaper. A theme that is requested more than any other (except solid paint with trim) is a two color stripe. 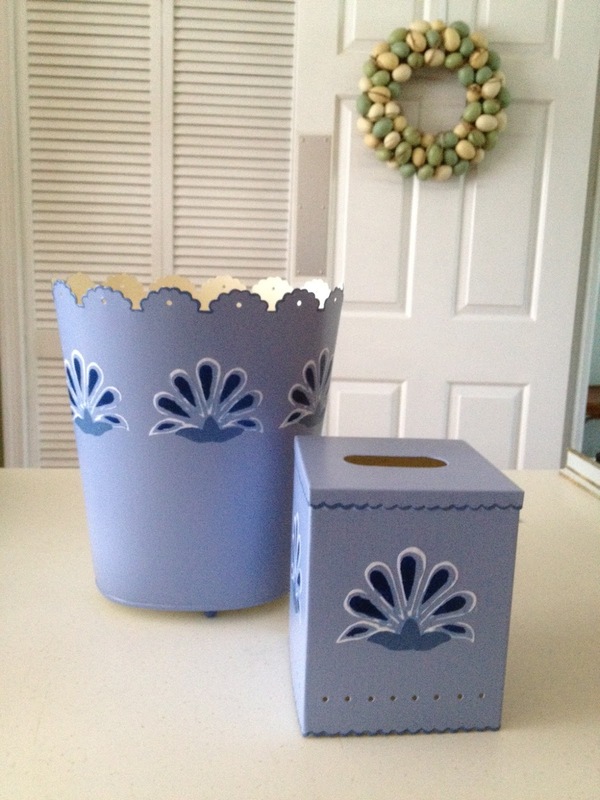 The beige one was metallic gold trim and the blue stripe had a taupe trim. Nearly every one we have made was one color plus white with a coordinating trim, but it doesn't have to be. 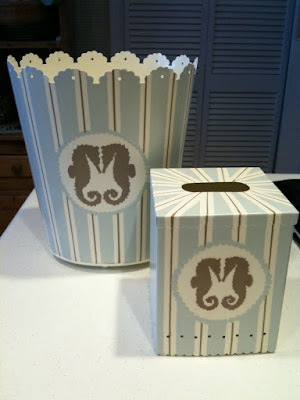 Choose two colors and a third trim color.....the world is your oyster. Here is a paint and découpage combination sporting a Beatrix Potter theme. 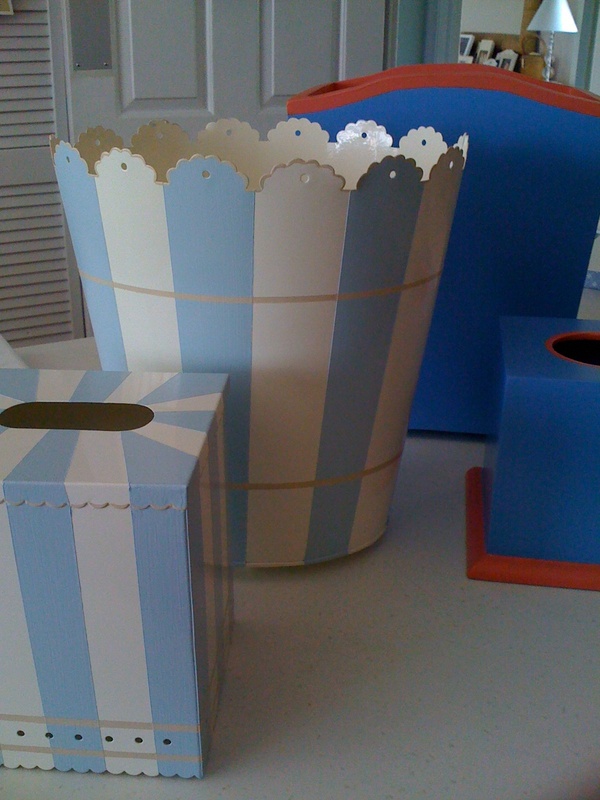 This set is great for a baby girl, but there are other characters more appropriate for baby boy. The six designs above were all hand-painted and custom-designed for our clients. Some wanted us to pick an element of design from their wallpaper or fabric or bedding. Others just wanted a unique design to fit their room. This Redouté rose was découpaged onto a candy-pink-stripe painted tissue cube. 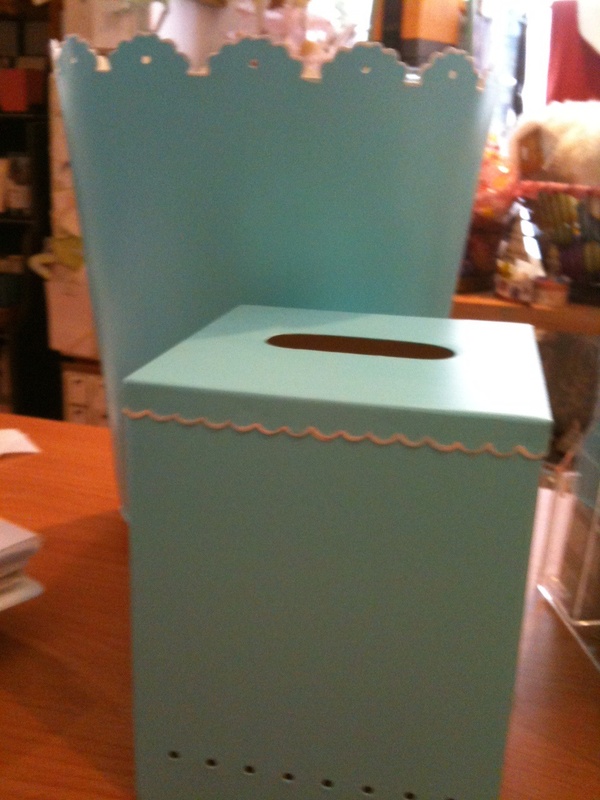 The client picked the color and we found the perfect rose. What a job cutting all those stems and buds !! 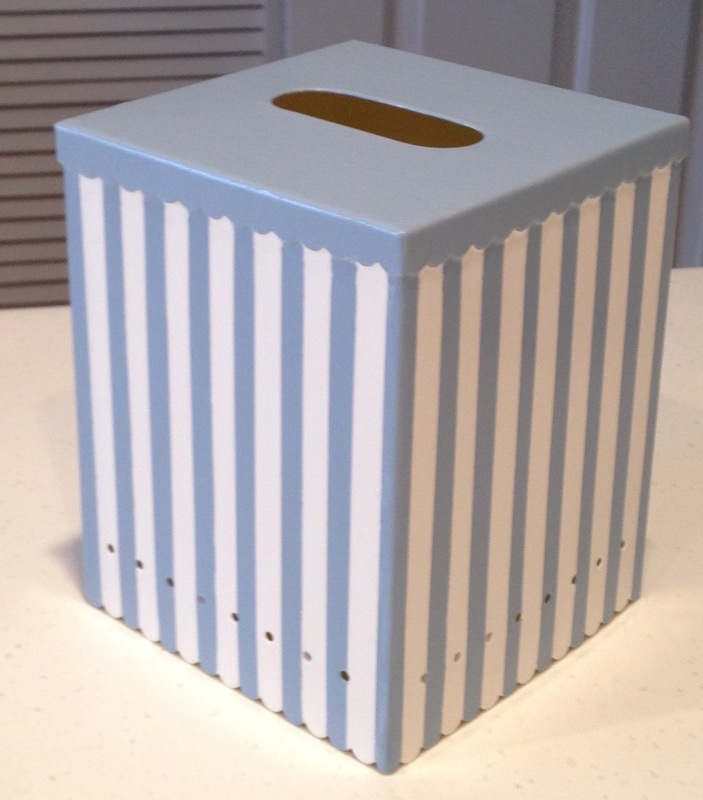 If you are a plain Jane or Jack, which most of us are, we can paint a simple one-color stripe or solid wastebasket and tissue box for you. So don't forget, if you are in need of a wonderful wastepaper basket and tissue box and none of the simply great ones we have in stock will not work for you, we can help you design your own.